The Thieves Guild is dedicated to the gathering and training of those who are stealthy and shadowy in nature. Although criminal by its very definition, for untold years, local authorities in places throughout Tamriel have tolerated the existence of the guild for its role as "crime regulator", as it does not tolerate competition or egregious conduct from its members (not to mention the personal financial benefits for authorities who play nice). It is usually considered to be a distinctly Imperial entity, though of course other organizations of the Empire do not officially condone their actions. Like any trade guild, the Thieves Guild is an organization of professionals, except that in this case the professionals are burglars, robbers, pickpockets, smugglers, and other enterprising operators. They typically don't have public guild halls, but sometimes have safe-houses, and members tend to gather at a single location in large towns, such as at a cornerclub, inn, or tavern. Typically, members are bound not to rob each other, kill anyone while thieving, or rob the poor. The Thieves Guild usually has the resources to bribe officials, establish a black market of stolen goods, and maintain a network of informants. For historical information, see the Lore article. Based in the city of Riften, the Thieves Guild's headquarters can be initially accessed through the Ratway, a network of tunnels that runs under the city. To join the Thieves Guild, travel to Riften and come into contact with Brynjolf, who can be found at the market stalls during the day, or the Bee and Barb tavern during the night. Brynjolf will approach you and question your wealth before inviting you to help him with a little plot. This begins the first quest, A Chance Arrangement, in which you must steal a ring and plant it on another person. If the quest is failed, Brynjolf will still give you the next quest. Travel down to the canals and enter the Ratway. Defeat the bandits and follow the tunnels to the Ragged Flagon, headquarters of the Thieves Guild. Here, Brynjolf will give you the next quest, Taking Care of Business, tasking you with roughing up three business owners for debts he needs collected. Access to the Thieves Guild headquarters. A suit of Thieves Guild armor. A suit of Linwe's Armor, a unique armor set obtained from a sidequest. A set of Nightingale Armor, the Nightingale Blade, and the Nightingale Bow after you proceed up the ranks. Three interchangeable unique powers once the Nightingale story arc is complete. Access to Chillrend, potentially the deadliest unique sword in the game and the strongest in the original game. Fences who will buy legally-obtained and stolen goods and will have larger amounts of gold available for trading than normal merchants (1,000 initially, 4,000 after completing all four improvement quests). Tonilia, the fence for the Guild, is one of the earliest vendors to regularly sell Daedric weaponry. Access to four new merchants at the Ragged Flagon, including a blacksmith and an alchemist, after completing certain sidequests for the Guild. Respawning locked chests ranging from novice to master for building up your Lockpicking skill. Free gold and lockpicks lying around the headquarters. Unlimited thievery radiant quests which reward gold. Master-level trainers in Lockpicking (Vex), Archery (Niruin), Pickpocket (Vipir the Fleet), and Sneak (Delvin Mallory). A set of Guild Master's armor (a decent light armor) and the Amulet of Articulation can be obtained once the main quest line and the guild improvement quests are completed. Dialogue option to avoid conflict with thieves encountered on the roads, later upgraded to such thieves paying you tributes. Guards can be bribed to remove bounties even if you have a low Speech skill and no bribe perk. The Skeleton Key, an unbreakable lockpick (temporary). The only way to learn all three words of the Disarm shout is to complete the first six primary quests. The primary Thieves Guild questline consists of twelve quests. Three achievements (50 points; 2 Bronze and 1 Silver) are unlocked by the guild's quests. A Chance Arrangement: Help teach a merchant to mind his own business. Loud and Clear: Send a message to a former Thieves Guild client. Speaking With Silence: Track down the Dunmer behind the Guild's misfortunes. The Pursuit: Break into Mercer Frey's house and search for clues. Trinity Restored: Become one of the Nightingales, Nocturnal's guardians. Delvin at his usual spot in The Ragged Flagon. Once you join the guild, you can speak to Delvin and Vex to receive radiant Thieves Guild quests. These jobs can be repeated indefinitely, and you can have one active job per quest-giver, but you must complete or quit your current job before you can receive another one from that particular quest-giver. In addition to the monetary reward for completing these quests, they also count towards restoring the guild's status in Skyrim. 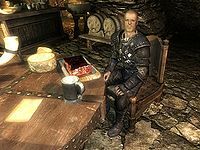 In order to start the final Thieves Guild quest, Under New Management, you must complete five of these jobs in each of the other four main cities in Skyrim (Markarth, Solitude, Whiterun, and Windhelm), at which point Delvin will give you a special "reputation" quest in that city. Completing these reputation quests improves the condition of the Ragged Flagon, and allows you to bribe city guards to clear your bounty in that hold. Once you complete Taking Care of Business, you can bribe guards of the Rift. Note: If you quicksave immediately after the dialogue ends, and before the quest is displayed on screen, you can quickload until you get a quest in the city you want. This can be useful if you want to focus your efforts on cities in which you have not yet completed restoring the Guild's status. You can also simply quit the quests, which will be marked as failed in your journal, then select new ones. You can do this an infinite number of times with almost no consequences; the item generated for the Burglary Job will remain permanently, making it hard to do another Burglary in that location, and bugs with the Fishing and Heist Jobs may remove non-quest items from your inventory. (DB) You may be sent to Raven Rock for the Bedlam or Fishing quests. The Bedlam Job is bugged, however, so it cannot be completed if you are sent there. The Fishing Job will work as normal, though there is no reputation quest associated with Solstheim. Reparations: Make reparations for breaking the Thieves Guild rules. Vald's Debt: Find the Quill of Gemination to clear Vald's debt to Maven Black-Briar. †This quest unlocks access to a Thieves Guild fence. The Thieves Guild is headquartered within the Ragged Flagon. This area is divided into a central chamber, featuring a tavern, and the Ragged Flagon - Cistern which is only open to members and serves as a living quarters. If you join the Thieves Guild, you will receive a bed, end table, and chest reserved for your own use and located next to the entrance alcove. All containers in the cistern are safe for storage. The cistern also features an alchemy lab, archery ranges, kitchen, and locked chests that respawn for Lockpicking practice. Upon first visiting this area, The Ragged Flagon will be gloomy, empty, and dilapidated, but will gradually be restored as quests are completed. The Ragged Flagon - Cistern improves with the fortunes of the Guild. When doing Delvin or Vex's additional jobs, you need to head out to four different cities: Markarth, Windhelm, Whiterun, and Solitude. After completing five additional jobs in a single city, you'll be assigned a special job for that city. After completing each special job, the condition of the Ragged Flagon will be improved and a new merchant will move into the main chamber. Additionally, completing a quest will enable you to use the Guild's influence to pay a reduced bounty when confronted by a guard in the corresponding city. Clearing your bounty with this method will also allow you to avoid having any stolen items in your inventory confiscated. 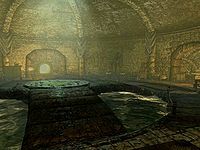 Upon completion of the main Thieves Guild questline, a Shrine of Nocturnal will appear in the Ragged Flagon - Cistern. When all quests are completed, the furniture in the Ragged Flagon will be completely replaced with more upscale variants, along with additional furniture and decorations. Syndus Bowyer and fletcher Available after completing one special job. Herluin Lothaire Apothecary Available after completing two special jobs. Arnskar Ember-Master Blacksmith Available after completing three special jobs. Vanryth Gatharian Armorer Available after completing all four special jobs. Garthar Thieves Guild recruit Complete three special jobs. Ravyn Imyan Thieves Guild recruit Complete all four special jobs. Shrine of Nocturnal Grants the Blessing of Nocturnal Available after completing Darkness Returns. Safe Contains random gold, gems and potions Complete 125 side-jobs for Delvin and Vex. 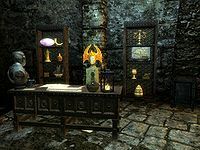 Various rare items can be stolen from around Skyrim and sold to Delvin. These items can be found in locations visited during the main Thieves Guild questline. Once sold to Delvin, the items will be displayed on the shelves behind the Guildmaster's desk. Collecting all the items is required to complete The Litany of Larceny. As you complete Vex and Delvin's side jobs, trophies will begin to fill the shelves behind the Guildmaster's desk. Jeweled Candlestick appears after 5 jobs. Ornate Drinking Horn appears after 15 jobs. Golden Ship Model appears after 25 jobs. Golden Urn appears after 35 jobs. Jeweled Goblet appears after 45 jobs. Jeweled Pitcher appears after 55 jobs (see bugs). Jeweled Flagon appears after 75 jobs. A safe appears next to the shelves after completing 125 jobs. 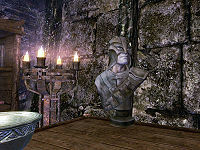 Upon completing No Stone Unturned, the Crown of Barenziah will be placed on the stone bust behind the Guildmaster's desk. Fences are a special kind of merchant that will buy stolen goods from you, removing the stolen tag in the process. Some Thieves Guild quests make available additional fences throughout Skyrim. Note that the Fence skill perk allows you to sell stolen goods to any merchant that you can invest in. Even with the Fence perk, however, Thieves Guild fences still have the distinction of having the most gold of any merchants in the game (with the exception of Lucan Valerius prior to version 1.9 of the Official Skyrim Patch, though his superior merchant gold is only due to a bug): up to 4,000 gold after completing all of the Special Jobs, and up to 5,000 gold with the Master Trader perk, making them useful even after the Fence perk is unlocked. Enthir is the exception to this. His gold remains at 500 or 1500 with the Master Trader perk. Tonilia The Ragged Flagon, Riften Taking Care of Business: Collect some debts for the Thieves Guild. 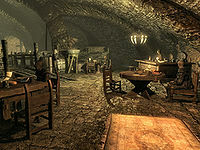 Mallus Maccius Honningbrew Meadery, outside Whiterun Dampened Spirits: Put Maven Black-Briar's competition out of business. Gulum-Ei The Winking Skeever, Solitude Scoundrel's Folly: Squeeze a reluctant informer for information. Niranye In the marketplace near the blacksmith in Windhelm Summerset Shadows: Remove a rival guild from the picture. Endon Wanders around Markarth Silver Lining: Recover a stolen silver mold for a silversmith. Enthir College of Winterhold Hard Answers: Help translate Gallus's journal. Atahbah Roams Skyrim in a Khajiit trading caravan with Ri'saad, may be found outside Markarth or Whiterun, or on the road between the two Thieves Guild Caravan Fence Quest: Deliver moon sugar to Ri'saad. The Thieves Guild is also responsible for the various symbols or runes, called Shadowmarks, etched or printed all around Skyrim. These marks are codes that previous thieves have left for future thieves. The legend for the code is outlined in a book of the same name, authored by Delvin Mallory. One copy of this book can be found in the Ragged Flagon - Cistern. If the option to upgrade your Thieves Guild armor is available, Tonilia will not give any other dialogue options, making it impossible to complete her other quests or gain the One with the Shadows achievement if the armor is irretrievable. This issue has been addressed by version 1.4 of the Official Skyrim Patch; this has been partially fixed - players without their Guild armor can find more in the Ragged Flagon Cistern. Sometimes items on Guild shelves fall off; if left untouched the item will remain on the floor, but if picked up to replace on the shelf the item may disappear upon your next visit to the Guild. This can be fixed by using the console command recycleactor on the items that have fallen off. The Jeweled Pitcher will not appear after 55 jobs as it should; instead, the Jeweled Flagon is displayed prematurely. In the console, use prid E8F04 followed by enable to display the missing pitcher. To disable the flagon, use prid E8F01 followed by disable. Sometimes side job rewards behind the Guildmaster's desk do not appear. If you are uncertain how many of the above they have actually earned, the console command show TGRMasterTotal will list the number of side jobs completed. The Thieves Guild caches may not appear after completing the correct quests. If too many miscellaneous quests for Vex or Delvin have been completed before you become a Nightingale, Delvin may only give out one guild improvement quest. Once this quest has been completed, no matter how many quests you do you will not get another improvement quest. Even though the chests are intended for you to practice your lockpicking, you will still be pushed out of the lockpicking screen if other Thieves Guild members can see you and you break a lockpick during your attempt (see Lockpicking notes). Wait until everyone has left the room. This page was last modified on 10 March 2019, at 21:31.